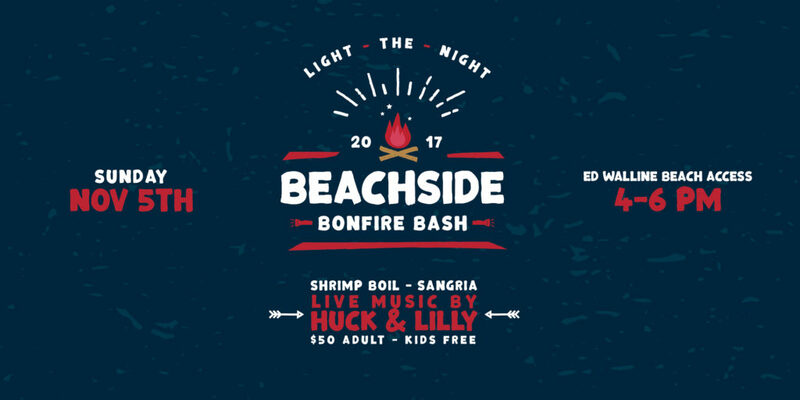 The Tree House Episcopal Montessori School will host its first annual Beachside Bonfire Bash on November 5th from 4-6pm at the Ed Walline Beach Access in Gulf Place. The bash is open to the public for families of all ages to attend. Tickets are $50 per person and free attendance for kids. The event ticket includes a shrimp boil, sangria, beer, live music and more! The kids will delight in glow in the dark toys, dinner, a s’mores bar and cupcakes. First 50 adult tickets purchased will receive a free kids Beachside Bonfire Bash T-shirt! Raffle prizes will be available so don’t forget to bring your cash. Prizes include a “Date Night” package to Emeril’s at Grand Boulevard and a “Spa Day” package to Serenity by the Sea spa. Raffle tickets will be available at the event for $5/ticket or 6 tickets for $20. Thank you to our sponsors and donors: Rent Gear Here, Shunk Gulley Liquor and Wine, The Dish and the Spoon, Realtor Rob Weil- Berkshire Hathaway HomeServices, SmallCakes, Framework Photography, Anne Wincki Realtor for Berkshire Hathaway HomeServices, and Impact Clothing and Design.